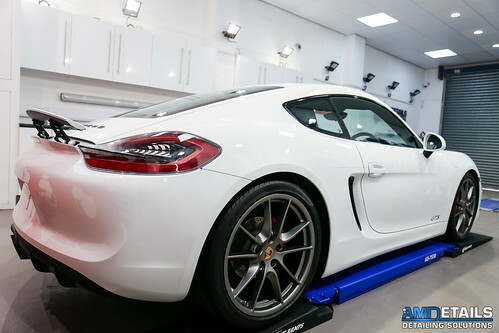 Porsche Cayman GTS in for a AMDetails Enhancement Detail with Gtechniq Crystal Serum and EXO V2. This Cayman GTS came in to us for the protection benefits and Guarantee that the Gtechniq Coatings offer. after inspection we found a lot of long scratch marks in the paint caused by a drying blade. The Enhancement Detail is a 2 stage machine polishing process to remove as many defects as possible in preparation for Gtechniq Coatings. As we show you in the video this is not a full correction detail and you can still slightly see some of the deeper long scratches left from the drying blade. Then after Gtechniq Panel Wipe the conditions are perfect for the application of Gtechniq Crystal Serum – Professional only coating. AMDetails are the Gtechniq accredited detailers for The Highlands and Aberdeenshire. 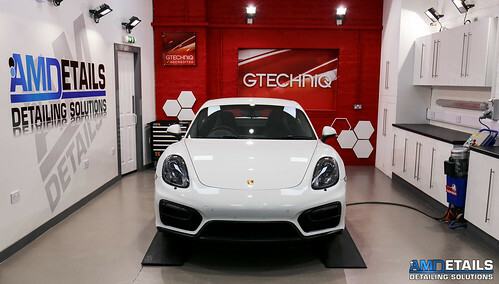 After the Single Stage Detail the Cayman GTS was then protected with Gtechniq Coatings.